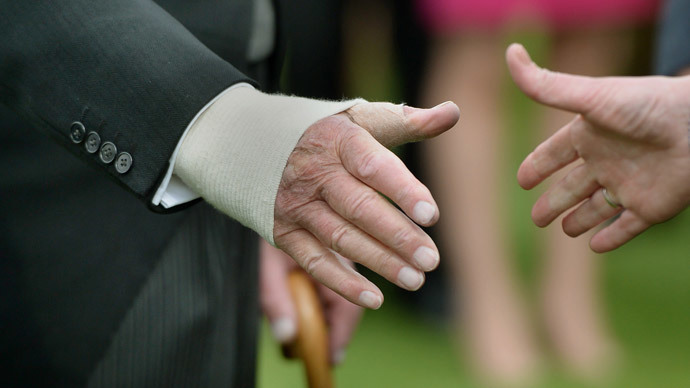 A strong handshake has always been seen as a sign of strength and power, but it now seems there's a more significant advantage to a firm grip – longer life. According to a new study, a weak squeeze is linked to a greater risk of heart attack and stroke. The Canadian-ledstudy, published in the Lancet medical journal, measured the health of 139,691 patients over a four-year period. The participants, aged 35-70, hailed from 17 culturally- and economically-diverse countries. During check-ups, patients were asked to grasp a Jamar dynamometer – an instrument that measures muscle strength – as hard as they could. Every 5kg (11lb) decline in grip strength was linked to a 16 percent increased risk of death from any cause, a 17 percent greater risk of cardiovascular death, and a 17 percent higher risk of non-cardiovascular death. The decline was also associated with a 7 percent increased risk of having a heart attack, and a 9 percent increased chance of a stroke. The results remained the same once other factors – age, physical activity, alcohol and tobacco use, education level and employment – were taken into account. “We think it fits the measure of someone’s frailty, and frailty can be thought of as your ability to withstand having a disease,” said Dr. Darryl Leong, an assistant professor of medicine at McMaster University in Hamilton, Ontario, who led the investigation. However, there was no link between handshake strength and diabetes, respiratory disease, fractures, or injuries from falls. Leong said that “grip strength could be an easy and inexpensive test to assess an individual's risk of death and cardiovascular disease.” He added that the findings would be of particular interest to developing countries, where health diagnostic equipment is less available. "A [handgrip dynamometer] is cheap and reusable. The test is really quick and easy to do. In resource-challenged settings this might be a useful test to identify patients that you think are at greater risk and need closer attention or might need more specific treatments," he said. However, Leong said that more research is needed to determine whether improving muscle strength reduces such risks, adding that healthy grip strength seems to vary in different ethnic groups. The countries involved in the study were Canada, Sweden, United Arab Emirates, Argentina, Brazil, Chile, Malaysia, Poland, South Africa, Turkey, China, Colombia, Iran, Bangladesh, India, Pakistan, and Zimbabwe.